The eigth edition of JoomlaDay France, after a few years spent in province, will take place in Paris, the 23/24 of May 2014: 2 days with conferences and workshops. Like every year, VirtueMart will be there for a conference and a workshop. VirtueMart, the ecommerce reference for Joomla, has experiencing a growing success : the 30k downloads mark was exceeded in 15 days for the latest release, and the version 3.0 will soon take off. An active international community . Then we will listen to you and answer your questions. Come and participate in one of the major events of this new edition of French JoomlaDay 2014! added loading of language if misssing (for example to the installation finished screen). VirtueMart 3 is almost ready. The situation is maybe similar to vm2.5.3. The more testers and reports the faster we can release. Please download Virtuemart 2.9 (the beta for VM3) here http://dev.virtuemart.net/projects/virtuemart/files. Search for the latest vm2.9.x, join us in the forum, tell us your experience with it http://forum.virtuemart.net/index.php?board=136.0. 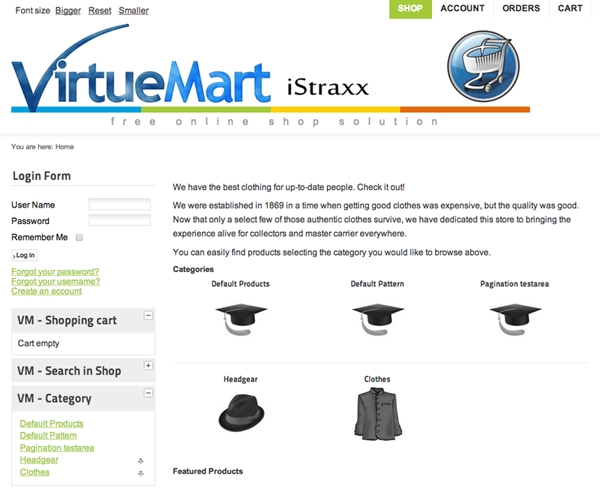 Release of VirtueMart 2.6, VirtueMart 3 for Joomla 3 is coming soon. New: Full Installer including Joomla and VirtueMart. With so many changes over the past couple of years, we noticed that many small and big features have been added to the core of VirtueMart. Some of these have been provided by 3rd party developers, whilst others were added as workarounds to remove/avoid bugs, or to complete a feature, which combined with our increased experience has translated into many more general and useful functions. A good example of an enhanced usable feature is the way in which Virtuemart automatically sends emails. In VM1 emails were generated automatically for any and all order status changes, but VM1 had a different cart workflow, so we simply adjusted the workflow and made more use of the order status email system, however this rebounded with a different problem, in that the merchants felt spammed by their own shop. To address this issue, as part of the enhanced features, we have added a configuration setting for mail, so you can control which emails are used, resulting in a better end user experience. In the meantime, the Joomla world moved on and released Joomla 3.x which also has some API changes itself, so we had to replace some of the Joomla functions ourselves (for example JText against vmText), which exposed the situation that some of these revised functions were not in VM2.0. So to give our 3rd party developers the chance to write extensions compatible for VM2.0 and VM3 we have introduced these general functions to VM2.6, which makes VM2.6 the perfect interim version between VM2.0 and VM3. The added features meant for VM2.2 and the implementation of the general functions required for VM3 justifies a direct jump to VM2.6 and also better reflects our progress in enhancing VirtueMart. The old VM2.1 trunk is completely synchronised with VM2.6 and will become the new VirtueMart 3; the version for developers is now VM2.9, so the VM2.0 series ends with VM2.6.x. VirtueMart 3 works on Joomla 2.5 and 3.2, which brings everything up to date and allows us to allocate our time now to developing VirtueMart 3. PHP 5.2.x is EOL since 3 years and 3 months. From the view of a technician or programmer there is no need to say that php5.2.x is completly outdated and unsecure. There are no fixes anylonger since 3 years, please read here http://php.net/eol.php. There are some critical issues in the encryption functions in the php5.2 versions. We worked as best backward compatible, but bugs are more likely. We even suggest to use php5.5 latest. - automatically encryptes storing of fields in the database. - Proper use of MyISAM and InnoDB according to its intended use. - added deletion of customfields if a protocustom is deleted. - reviews emails: not sending an email when the review has not been saved. VirtueMart is 2! Happy Anniversary! 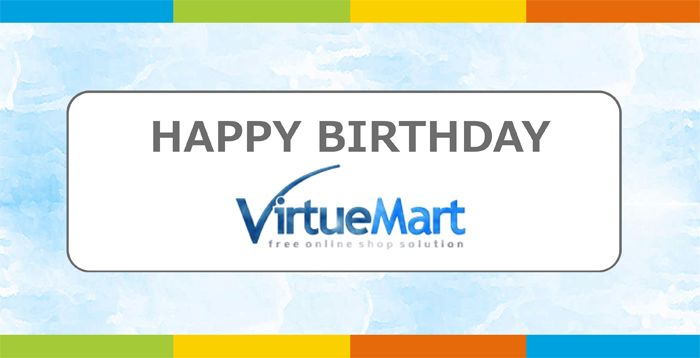 The team is very happy to announce the second birthday of VirtueMart 2. Within the two last years more than 1.5 million downloads have been made. Each release included massive improvements with constant and steady development. We are happy to know that the vm2 ecosystem is running well and there are so many extensions that adds value to VirtueMart, like payment and shipment systems, SEM, product builder and so much more. Read more about our roadmap. Our sales tax automation extension Avatax is offering 50% off activation fees for the holidays. The end of the year is fast approaching. Businesses are looking for ways to continue to streamline and improve daily operations into 2014. If you, respectively your customers are still managing sales tax compliance manually what better New Year’s resolution than to automate sales tax! With the craziness and extra spending that the holidays bring why not take advantage of our offer for you, 50% off activation for agreements signed by December 31. We are pleased to announce that PayPal Express Checkout, PayPal Pro and PayPal Pro (Hosted) are now available through VirtueMart’s ecommerce solution. If you already accept credit cards online, you can decrease shopping cart abandonment and boost sales by adding the PayPal Express Checkout button to your site. It complements your existing payments solution and can open the door to over 137 million active PayPal accounts* who look for and use this fast, easy, and secure way to pay. PayPal Pro is an all-in-one payment solution that enables you to control your customers’ checkout experience from start to finish. It comes pre-integrated with your VirtueMart store, so is easy to switch on through the VirtueMart admininistration area. More ways to get paid– accept major debit, credit card and PayPal payments directly on your website and by phone. Greater control – Pro gives you a merchant and gateway account in one, enabling you to manage your transactions through a single relationship. Easy to switch – Pro comes pre-integrated with VirtueMart and your Pro account could be set up within a week. No hidden costs – you pay a fixed monthly fee, plus a small transaction fee every time you get paid. Dedicated local business support – help is just a phone call away. Advanced security – Pro comes with advanced fraud and security features and is PCI compliant (Hosted version). Fixed getNeighborProducts using sortSearchListQuery query. should now work correctly for most types of ordering. Fixed typo in "order confirmation layout"
Fix in vmmodel.php to prevent the error "Warning: strpos() [function.strpos]: Empty needle in .../vmmodel.php on line 213"
Heidelpay: switch on sepa for direct debit. You can now use IBan and Bic, instead of account and bank no. We are proud to announce that effective today, Klarna Checkout is available for VirtueMart! Klarna Checkout is the revolutionary payment solution that changes the way the world shops online. With Klarna Checkout, you can offer your customers all the popular payment methods in one payment solution. Ingeniously simple and friction free. Klarna Checkout is today available for Sweden, Norway and Finland.